Mr. Malpass is being tapped to head the World Bank after its previous president, Jim Yong Kim, abruptly announced in January that he would resign from the post, nearly three years before his term expired. Other countries have until March 14 to offer their own candidates for president and, on Wednesday, a World Bank official said that at least one other country is expected to nominate someone. The head of the World Bank is traditionally selected by the United States, but the nomination must be approved by the bank’s board, which consists of officials from across the world. Mr. Malpass said he had already received numerous expressions of support from other countries. He will begin a six-week confirmation process by traveling to Japan and China to present his credentials and ask for support from officials from those countries. He will also join the American delegation heading to Beijing next week for the next round of trade talks ahead of a March 2 deadline. 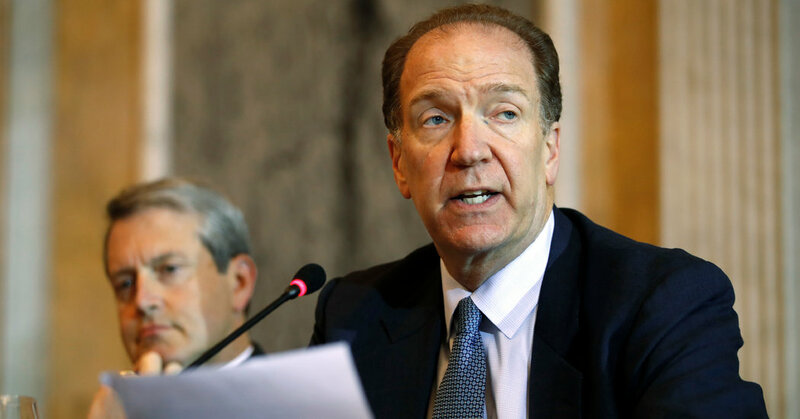 As World Bank president, Mr. Malpass could put additional pressure on China at a time when it is locked in a protracted battle with the United States for geopolitical and economic dominance. The Trump administration has been urging the bank to reduce lending to China, which since 2016 has received more than $7.8 billion in bank loans, according to the Center for Global Development. In comments in 2017 at the Council on Foreign Relations, Mr. Malpass argued that this should change. Last year, Mr. Malpass helped negotiate a $13 billion capital increase for the World Bank. One condition of the agreement was that richer developing countries, such as China, would face higher borrowing costs.